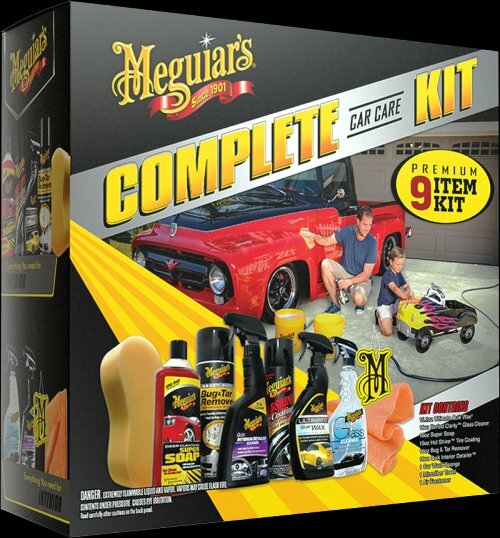 To gear up for the holiday season Meguiar’s has put together the ultimate car care kit. The kit is perfect for dads, grandparents, uncles or even the busy mom on your shopping list! The Meguiar’s Complete Car Care Kit has inspired automotive enthusiasts worldwide to pamper, condition, and protect their treasured investments. This is one of the most complete kits on the market today, featuring Meguiar’s premium-quality products in one convenient, affordable package. It includes one 16-ounce bottle of Gold Class Car Wash Shampoo and Conditioner – G7116, one 16-ounce bottle of Gold Class Carnauba Plus Liquid Wax – G7016, one 16-ounce bottle of Gold Class Endurance High Gloss Gel – G7516, one container of Quik Detailer – A3316, one 16-ounce bottle of Quik Interior Detailer Cleaner – G13616, two 50-gram clay bars with a clamshell container – R30-60-008, R30-60-120, one container of PlastX Clear Plastic Cleaner & Polish – G12310, one container of ScratchX – G10307, one microfiber towel – M9910, one foam applicator pad – R30-60-241, and one Microfiber Wash Mitt – X3002.